Having your own backyard orchard in the form of your favourite fruit trees is a great addition to your organic garden. Growing fruit without chemical herbicides and pesticides is a great way to experience the fresh taste of edible garden fruit. If you venture into most older properties you will generally find a lemon tree and one or two fruit trees which would probably include a stone fruit or possibly and apple or pear. This is something that has declined over the years possibly due to the belief that fruit trees take up to much room. A well maintained fruit tree takes up very little room and with the number of dwarf fruit trees available these days that provide full size fruit this is far from the truth for those people with small yards. Whilst your crop will be smaller the amount of fruit you receive will be more than adequate for your personal use. The use of dwarf fruit trees can make your backyard look larger and as they are compact you can have your own mini-orchard. In addition to dwarf varieties you can now purchase citrus and fruit trees which are multi-grafted which means that they have more than one variety on each tree. Fruit and citrus trees prefer to have mulch around their base rather than compete against grass so one option is to fence off the fruit trees or orchard and allow your chickens to have this area as a run with a layer of heavy mulch on the ground. In addition to the chickens keeping this area clean of pests and weeds you have the added benefit of the chickens fertilizing the fruit or citrus trees. Many of the dwarf varieties will also grow equally well in a large pot or half wine barrel which you can locate in any sunny position in your backyard. All fruit trees require a well drained position and prefer a sunny and wind protected position. Fruit and citrus trees do like regular deep watering until established and fertilizer applied to fruit trees in early spring and late summer and for citrus trees in late summer and again in late winter. Yummy Gardens Can Help You To.. 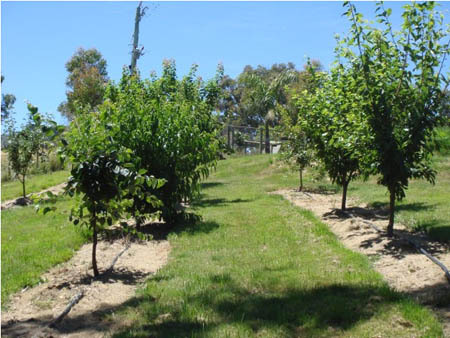 Call Yummy Gardens today on 0431 382 230 to chat about the fruit trees you'd like in your backyard orchard.